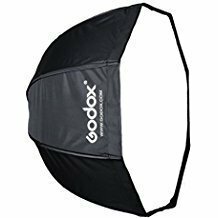 Material: Nylon Material, Aluminum Shaft Propagation Surface: 32 \ "/ 80 cm Color: Black / Silver (in / out) Shape: Octagon Package Content: 1 x 32" octagonal softbox light diffuser / 80 cm Portable 1 x front cover 1 x carrying bag) Note: Light stand, flash mount and flash not included. The light diffusion surface diameter is 32"/80cm, with wide range of applications, suitable for portrait or product photography. View More In Lighting Controls & Modifiers.